Teach your toddler or preschooler the ABC's by crafting a letter each week! 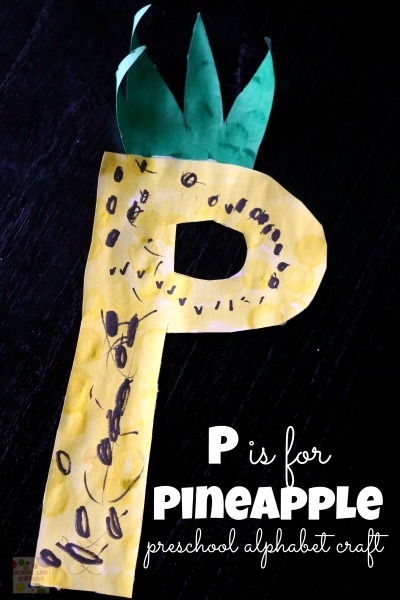 Make this fun pineapple Craft for the Letter P.
Alphabet crafts are such a fun way for preschoolers to explore the letters of the alphabet. My preschooler loves crafts, so these activities are a perfect way for her to be engaged in the learning process and have fun at the same time. We are hitting the letters of the alphabet in random order; in case you missed it, the last alphabet craft we shared was Letter J is for Jewels. 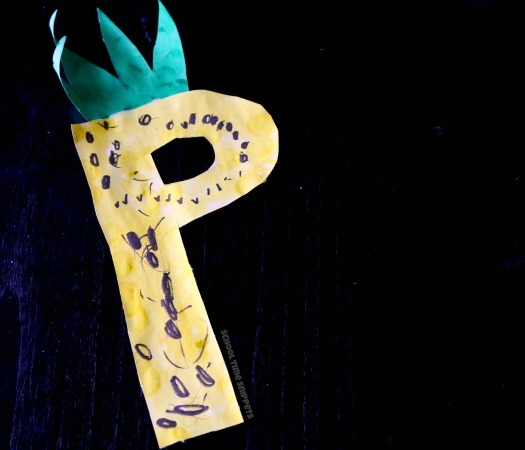 Well, we've moved down the alphabet a few letters and made an alphabet craft for the Letter P.
We were inspired by this fun fingerprint pineapple craft and decided to do Letter P is for Pineapple! Draw or print out an outline of the letter P and draw out a stem shape. Provide Do A Dot markers in yellow and green. Encourage your child to dot the Letter P in yellow and the stem shape in green. Once finished, have your child make brown dots or scribbles with a marker on the pineapple. Cut it out and glue the stem onto the pineapple. Your P is for Pineapple alphabet craft is all done. Turned out so cute! I think this would also be a great time to grab a snack.... pineapple chunks, of course! Don't Miss Our Letter Crafts A-Z!